You know what they say… if something can get dirty, it can get cleaned. Chances are people will pay to get their dirt cleaned up. And companies will too. No wonder this is a $49 billion a year industry trending to expand in the years to come as our way of life gets busier and people lack the time to perform such tasks themselves. So if you’re looking for information on how to start a cleaning business, congratulations, you’ve made a perfect choice. However, there’s much for you to learn in order to successfully start a cleaning business and succeed in the market. It would certainly be wise of you to equip yourself with as much information as possible prior to starting a cleaning business. Starting from right here. We’ve compiled a detailed guide on how to start a cleaning business, with as much detail as possible, covering as many aspects of the market as possible. This is going to be a long read for sure, but we trust you’ll find it very useful and helpful towards starting a cleaning business of your own. To professionally join the cleaning industry, you must come to understand your target market groups. In other words, you must know who your clients are and what is it exactly that they want from you. There’s two primary market groups, consumer (residential) and commercial. While you can focus on one, the cleaning industry offers abundant opportunities and provided you’ve got the right skills and time, you can expand into both. If you choose to offer B2C (Business to Consumer) services alone, your tasks will mostly consist of residential maid services. This includes cleaning windows, carpets, curtains, various indoor appliances to name a few. All the tasks your cleaning business will be called upon are fairly easy to handle, however the services required are not as frequent. The upside is that getting cleaning contracts in this case is an easy task, most of the time. You can begin advertising in your neighborhood with nothing more than a few flyers or simply take advantage of your social circles to attract your very first clients. The other market is commercial cleaning services. You’ll be offering B2B (Business to Business), janitorial services. To attract companies, you’ll need to offer a wider range of services as compared to targeting individuals. It would be wise to offer an “all in one” cleaning service when applying to companies. However, this is not mandatory. There are cleaning businesses that specialize in cleaning windows or cleaning carpets for example which you’ll probably find yourself sharing a client with. While it’s recommended that you focus on one market or cleaning service (i.e consumer, carpet cleaning) when starting up, it’s totally realistic to expect your business to grow over time and expand into other markets, undertaking more clients, maximizing profit margins. Consumer focused services are less frequent. The profit margin is low compared to commercial cleaning services but still very high compared to your initial investment. On the other hand, offering such services may require simple equipment to begin with and thus, less capital invested. Another advantage is that if you have limited money to invest, you can start working on your own if you don’t mind your hands getting dirty and hire employees as your cleaning business grows. If you choose consumer oriented services, you might want to consider running a home based cleaning business. You can use your home as your base of operations, providing maid services to households near you. It’s a great way to start a cleaning business since it requires very, very little investment to get started. In fact, if you own some very basic equipment for cleaning up your own home, you’re good to go. You may hire other people on the go and as you see fit. Then wait till you have raised some money so you take the next step and expand your business (obtaining offices, vehicles, more employees etc). Not a step you have to take. It’s up to you whether you’re going big or keeping your business small. In this case, the finest choice of clients would be families with two working parents (so they don’t have time themselves to clean their house), preferably with a strong income flow. That would be 40.000$ to 60.000$ a year. Definitely not your only possible clientele but if there are families under those criteria near you, it’d be easier to start with those. Commercial focused services are usually frequently needed. This is good because you can establish a very steady income source with a handful of clients alone. A steady income flow goes a long way into planning your business expansion and tracking your finances overall. Of course, the profit margin in this case is vastly superior to simply offering maid services. However, you’ll definitely need management skills as it’s impossible to clean an entire business, hospital, school or anything of that size by yourself and thus, you’ll need to build and manage a team of cleaners. Aside of the monthly salaries, you may have extra costs when it comes to buying better equipment, renting offices and storage space, obtaining a better janitorial bidding software, marketing your business to clients etc. However, even though the investment needed to start a commercial cleaning business is high compared to offering consumer oriented – maid services, it’s still pretty low when compared to most business categories. And the profit margin is certainly an encouragement. The work load is heavier than maid services but with proper organization and staff management, you shall face no difficulties. What makes commercial cleaning businesses so wanted is the fact that most businesses need to comply with state regulations, not to mention making a good impression on their clients. The market is there, it’s real and it’s hungry. You just have to learn how to start a cleaning business that can provide with high quality services to impress your clients and make it hard for them to pass on your offer. No matter how you choose to begin, this is a very lucrative business and once you get the hang of it, the money is awesome! To ensure you don’t miss anything vital prior or during your cleaning business launch or avoid management and marketing mistakes while operating, you should seek expert advice. 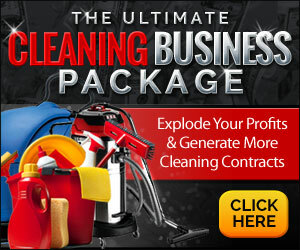 A very good place to start is the Ultimate Cleaning Business Package. It’s the best course/resources bundle out of many we could get our hands on and it comes with plenty of extras. If you’ve been wondering how to start your own cleaning business, offering carpet and upholstery cleaning services is a great way regardless of the type of cleaning business you choose to start up with, residential or commercial. In fact, most carpet – upholstery cleaning services do start from home. Some evolve in commercial cleaning businesses down the road, some don’t and keep operating from their homes. Still, they make a great deal of money. While a cleaning business doesn’t ask for serious expertise, technical skills or capital investment, it still IS a business. And as such, it requires some qualities from it’s owner. It would be wise to ask yourself if you match those qualities. So, what should you expect as a cleaning business owner? Well, for one thing you came here looking for information on how to start a cleaning business. Which is the first step. What comes right after is understanding that due to the nature of this business, people may be looking down on you on your first steps. There’s no glamor to this business. However, once the paychecks start rolling in, all that’s about to change. Nevertheless, you must make your piece with the fact that some people may underestimate you due to the fact you’re running a cleaning business. So ask yourself if you’re strong enough to deal with it should it happen, ever. Other qualities you need to search inside for are integrity, honesty, willingness to succeed as a business owner and belief to high quality services. You need to do your best to impress your clients. That includes communication. You must be polite with them and remember that the client is always right, no matter what. Communication and relationship building is also important when it comes to your employees, not just customers. Especially if you’re running a commercial cleaning business, your skills must include basic knowledge on how to administrate a business, hiring and managing staff, accountants and so on. About your cleaning skills, you’ll obviously need more knowledge to perform carpet cleaning than washing curtains. Maid services are generally easier and only basic cleaning skills are required but commercial cleaning businesses are more complex and require further skills in which you must be trained. There are several courses that you can start with, see the end of this post for detailed information. So that’s how to start a cleaning company, how to start your OWN cleaning business. Now that you know the basics and have an insight on the market, the types of cleaning businesses out there and the personal qualities required to get started, it’s time to move on to Part II of our “How to start a Cleaning Business Guide”. very informative about the cleaning business,so greatful.